Is Demolition The Name of Your Game? – Surestrike International, Inc.
For your toughest concrete recycle and demolition applications turn to Surestrike International’s complete line of impact hammers. Reliable quality from a trusted and proven manufacturer for over two decades. 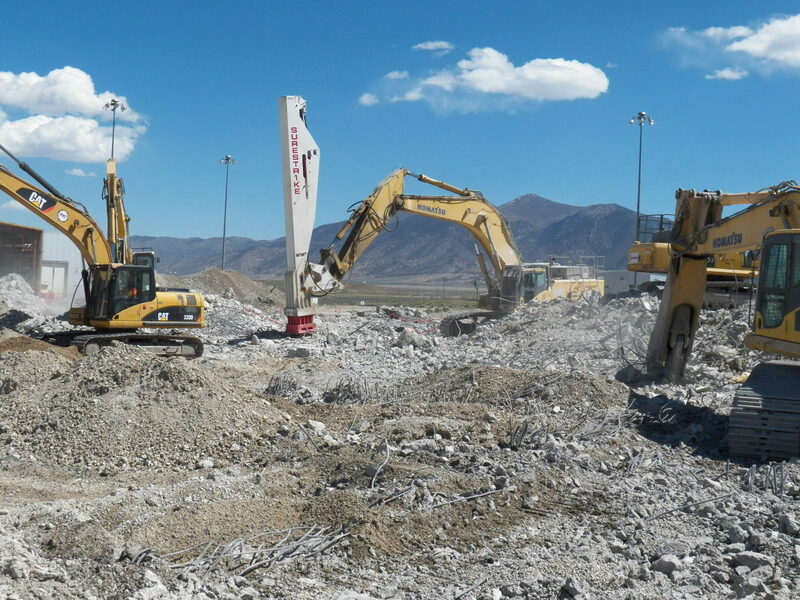 When one of the top environmental and demolition contractors in the US was in the middle of a challenging contract they turned to the team at Surestrike to help complete the job. Midway through the large scale project that called for the contractor to break and size concrete demolition material ranging up to 48″ thick, containing 1″ to 2″ rebar, a Surestrike SS150 was brought on to the site. The onsite team had been using four 16,000# hydraulic hammers prior to the Surestrike impact hammer arriving. In addition to the large concrete blocks, the contractor was also tasked with sizing and breaking 6′ to 8′ footings. While the hydraulic hammers were breaking the material onsite the contractor found the production to be slower than needed and the maintenance cost to be greater than was desired. With the SS150 in place the customer completed the project and stated that if they had put the Surestrike in place at the start of the job they could have eliminated two of the hydraulic hammers and saved upwards of 1 month of production time. Adding to increased profits and reducing wear and tear on the other equipment on the job. ← Dimensional Granite Have You Boxed Into A Corner?